Archer Season Three Is A funny spy show for adults. 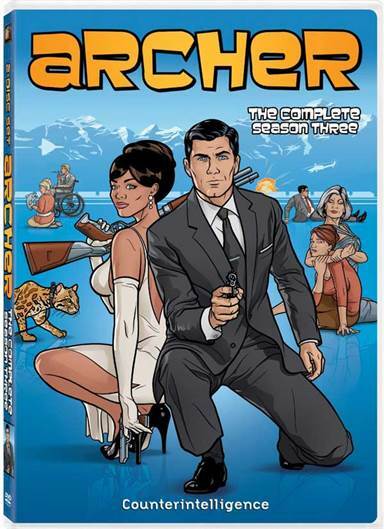 One of the funniest and campiest series on Cable TV, Archer (Season 3) has been released on DVD. Started in 2010 on FX, the animated sitcom has become a favorite with a huge following. The DVD comes in a 2 Disc set and has all 13 Episodes from the 2011 to 2012 airing. In addition it has three special features and commentary on select episodes. If you have not seen Archer, it won't matter because their off-the-wall comedy doesn't really need catching up. It's nice that you can just pick up and start from any season. The characters remain the same and include some of the most ridiculous spies and office help that have been ever animated. The sitcom follows an undercover International Secret Intelligence Service, under the acronym ISIS. The agency is located in New York City above a clothing cleaner storefront that acts as an employee entrance for the spy group. The cast of ditsy characters include Sterling Malory Archer with the spy name of Duchess. The show has him as one of the most dangerous secret agents on the globe and that's mostly his opinion of himself. Very self centered Sterling thinks he's invincible, incontestable, and irresistible to women. He's proficient in every weapon, yet the unavoidable mistake does happen now and then, but he seems to get away unharmed. Sterling's the first one to accept a challenge and the first one to let everyone know how good he did. His sidekick, hired for him by his mother as a safety precaution, is Lana Kane (Aisha Tyler) a gorgeous woman and the best female spy. She will do anything for ISIS even if it gets inappropriate. Going on assignment with Sterling, she's the first to jump in and save him, even if he's the one who takes all the credit for being saved. Lana usually takes the brunt of the work even though she's still billed as number two. Sterling and Lana are the main characters although mother Malory Archer (Jessica Walter) runs the show, gives out the assignments and usually takes on a few visiting spies in her boudoir. She loves her business as much as her alcohol and finds herself in some very precarious situations. Others adding to the plots and creating a lot of comedy aimed at their position in the firm are Cyril Figgis (Chris Parnell) as the office business manager/secret agent wannabe who tries to horn in on assignments. He's taken advantage of by all the other characters in the show, especially Lana until the ‘breakup'. Mallory Archer's secretary Cheryl Tunt (Judy Greer) provides a lot of laughter swooning over Sterling or whomever she can gets her hands on. Every season has enough laughter to want see the next. While back seasons are available, here is a list of Season 3's episodes with comments on those I like best. Episodes one through three is continuous and without the ads and having to wait a week between them, the enjoyment's even better. In 1-3 Sterling Archer who has been missing Rip Riley (Patrick Warburton doing the voice) gets hired by Mallory to find him. Archer turns up as a Pirate in part two and in part three Archer makes an attempt to escape. Other standout episodes include number 4 "The Man from Jupiter" with Archer meeting his all time favorite Burt Reynolds. Of course you just know that Reynolds is going to hit on mother Archer if she has anything to say about it. Episode six "The Limited" features Mallory, Cyril and Cheryl on a train with a terrorist. Some of the tongue-in-cheek comedy gets way over the top in this segment. Finally, I love the last two episodes 12 and 13 called "Space Race Part I & II" where ISIS members find themselves trapped on a space station following a mutiny. Episodes 1 through 3 "Heart of Archness Part I, II & III"
Episode 4 "The Man from Jupiter"
Episodes 12 & 13 "Space Race: Part I & II"
The sound quality on the DVD using the Dolby Digital 5.1 format suits my speaker system giving a very good clarity without any distortion. Some of the special sound effects do stretch across the room and my surround system picked up some of the background chatter, gun fire, etc. As for the visual quality, I found no clarity problems or grain and the colors were bright. There's not a lot of enhancement with the DVD format but for animation there's not much you can do with it. The show focuses on 2D animation so depth of field isn't even an option. There are only a small number of special features on the DVD and those that are included are just an added treat. "Heart of Archness Trilogy Enhanced" here the episodes get stretched to include a little. "Book-on-Tape Fail" involves Archer in a confrontation with the director. Commentary is available on three of the episodes: Drift Problem, Lo Scandalo and El Contador. Download Archer: The Complete Third Season from the iTunes Store in Digial HD. For more information about Archer visit the FlickDirect Movie Database.